Be Our Friend and Find AMAZING Deals! Because experience and professionalism count! Trust your project and your budget with Mr. Plastic! Mr. Plastic's history is really the story of our family. This logo was created in 1976 for the first Mr. Plastic in South Africa and it has been our symbol for more than three decades. Eugene Snyman sold Mr. Plastic in South Africa and we moved to the United States in 1997. 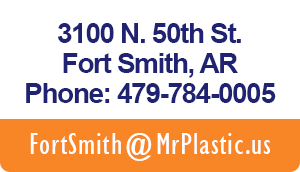 He worked for a big player in the plastics industry and landed in Fort Smith, Arkansas. Soon after, tides turned and the corporate structure could not support a location in Fort Smith. 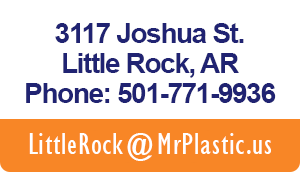 Seeing the opportunity in Arkansas, Mr. Plastic was reborn in America in December 1998. For the next eight years, the company grew out of the tireless efforts of Eugene and his late wife, Danette. Every few years the Mr. 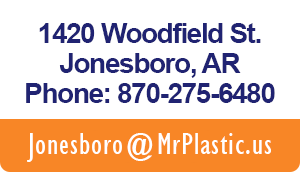 Plastic had to move into a warehouse that had enough room to serve the ever increasing needs of our customers. Our company's service is a point of pride for our family, our customers expect it and our tradition demands it.